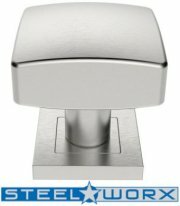 To view the full range of stainless steel door levers then please go to the 'Door Handles' section using the lefthand menu bar. Stainless steel square door knobs, 62mm diameter square knob on sprung back rose 52mm square x 8mm depth in 304 grade satin stainless steel. Supplied in pairs with follower bar and fixings.